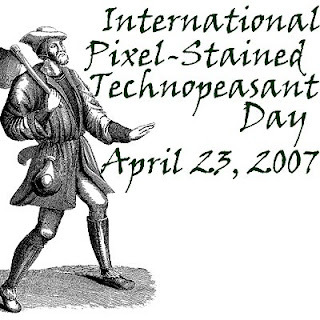 You might be thinking: So what's this Technopeasant Day thing about? Well, for one thing, we're about four days late with the announcement, but it's better than nothing. Technopeasant Day is simply one day in the year when professional authors are encouraged to post their works online for free. In this case, most of the authors write science fiction and fantasy. Is there anything good to read? Well, if you like Charles Stross, he's giving away his new novella Missile Gap for free. Find more authors by scrolling through the whole list.